We are amazed and grateful for the endless energy, passion, dedication and countless hours invested by our contributors: those in years past, current committee members and future volunteers to come. Most importantly, the sincerity, warmth and openness of all that have come together for this initiative is the most inspiring. Thank You! EQxD Core Team 2018: Rosa Sheng, Lilian Asperin, Julia Mandell, and Annelise Pitts. Equity by Design 2018 Symposium Volunteers - Danielle Lindsay-Chung, Amber Evans, Athena Do, Suzan Ozcelik, Zahraa Saiyed, Patricia Heye, Beth Nelson,Brittany Tse, Antonia Bowman, Julia Weatherspoon, Patricia Alarcon, Scarlet Entwistle, Bridget Basham, Miki Hirai, Emily Wheeler, Taylor Dearinger, Corina Dumitrescu. Special Thanks to: Jenn Jones, AIASF Executive Director, Rosa Sheng, AIASF 2018 President, 2018 AIASF Board of Directors, AIASF Staff, AIA National, NCARB, ACSA, NAAB, AIAS, NOMA and everyone who participated in the survey. We would also like to acknowledge all our sponsors for their gracious support. EQxD Core Team 2017: Rosa Sheng, Lilian Asperin, Saskia Dennis-van Dijl, Julia Mandell, and Annelise Pitts. EQxD Workshop Contributors: Michael Thomas, Helen Bronston, Sandra Vivanco, Ming Thompson, Jenn Jones, Maia Small, Garrett Jacobs, and Jill Bergman. Special Thanks to: Jenn Jones, AIASF Executive Director, Paul Cooper, AIASF 2017 President, 2017 AIASF Board of Directors, AIASF Staff, AIA National, NCARB, ACSA, NAAB, AIAS, NOMA and everyone who participated in the survey. We would also like to acknowledge all our sponsors for their gracious support. EQxD Core Team: Rosa Sheng, Lilian Asperin, Saskia Dennis-van Dijl, Julia Mandell and Annelise Pitts. We would like to thank the following contributors for their support in 2016. Equity by Design Symposium Volunteers - Lucinda Tay, Danielle Lindsay-Chung, Anesu Dhliwayo, Amber Evans, Lauren Maass, Heather Chicoine, Abigail Hammett, Patricia Galvan, Suzan Ozcelik, Zahraa Saiyed, Madelyn McClellan, and Jenny Guan. Special Thanks to: Jenn Jones, AIASF Executive Director, Aaron Highland, AIASF 2016 President, 2016 AIASF Board of Directors, AIASF Staff, AIA National, NCARB, ACSA, NAAB, AIAS, NOMA and everyone who participated in the survey. We would also like to acknowledge all our sponsors for their gracious support. EQxD Core Team: Rosa Sheng, Lilian Asperin, Saskia Dennis-van Dijl, Amber Evans, Julia Mandell and Abigail Hammet. We would like to thank the following contributors for their support in 2015. 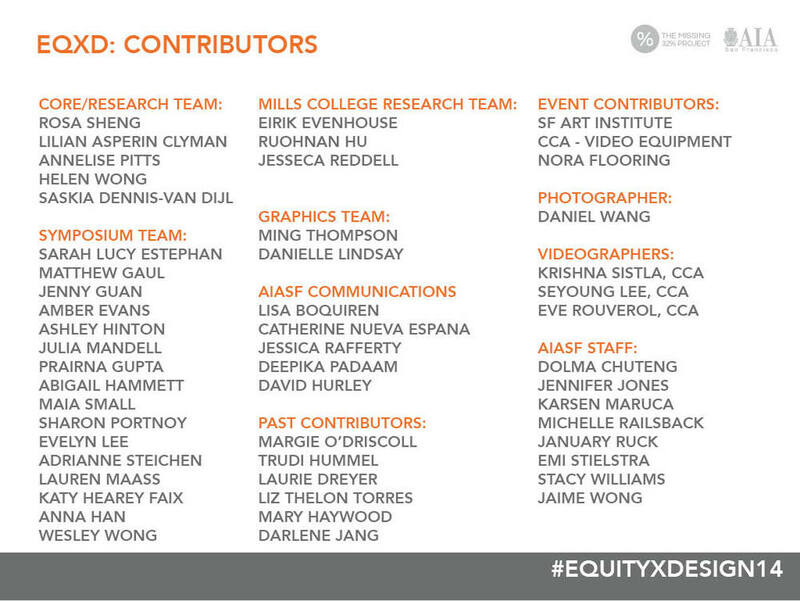 Special Thanks to: Jenn Jones, AIASF Executive Director, Irving Gonzales, AIASF 2015 President, 2015 AIASF Board of Directors, AIASF Staff, AIA National, everyone who participated in and supported our 2015 EQxD "U" Workshops, endorsement of the AIA Resolution 15-1 for Equity in Architecture and attending the inaugural AIA Convention EQxD Hackathon Program. We would also like to acknowledge all our sponsors for their gracious support.